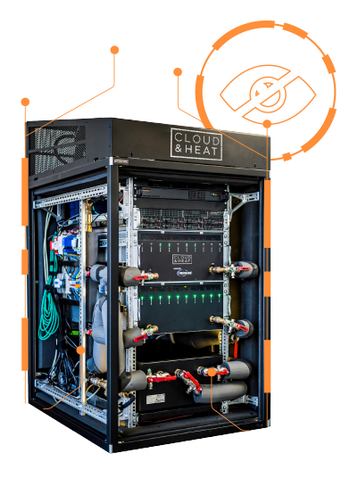 German distributed computing startup Cloud&Heat has received €10 million in venture capital to expand its specialized data center business. The company is developing server enclosures that use warm water for cooling and export it at a 60C degree temperature – which means it can be used for heating without the need for expensive heat pumps. The system has been successfully deployed in residential properties in Germany, as well as in several enterprise data centers. The series B funding round was led by ETF Partners and existing investor Inven Capital. "The development of Cloud&Heat since our first investment in May last year is impressive. The former start-up has become a major global player in the market for energy-efficient data centers. Therefore it was not a question for us whether we would also participate in this new financing round," said Petr Míkovec, managing director of Inven. Dresden-based Cloud&Heat was established in 2011 to develop modular, water-cooled data center systems that can be installed where heat is required - in locations such as office buildings or apartment blocks. Its main product is a ‘data center in a box’ that integrates all the necessary compute, networking and storage equipment, and is designed to work with the OpenStack cloud platform. It is also fully compatible with GPU-heavy servers, used for emerging workloads in research, analytics and machine learning. The enclosures use direct-to-chip cooling for increased efficiency – warm water is circulated through a network of pipes and heatsinks attached directly to the hottest elements of the server, like CPUs and RAM. This warm water can then be reused for heating purposes. This approach reduces the energy required to cool the data center, and as a result, its carbon footprint, and gives operators an additional source of revenue. For large-scale deployments, up to five of these server enclosures can be integrated in a single shipping container, with energy density up to 350kW per container. Cloud&Heat says the additional capital will be spent on international expansion and also boost its R&D efforts. The announcement of additional funding is especially interesting when you consider that the company has operated on just €5.15 million for seven years. "I thank ETF and Inven for the trust they have placed in us and for sharing our vision of a green digital future. With the new capital, we will now achieve our goals even faster. In particular, after success in Scandinavia and Asia, we will now be able to address other key markets such as the USA," says Nicolas Röhrs, CEO of Cloud&Heat. The company’s approach to data center heat is gaining popularity: Cloud&Heat says it has already sold four times more systems this year than during the entire 2017. Earlier this year, it signed a regional distribution agreement with Japan’s Inabata, a subsidiary of Sumitomo Corporation.